Goooooodmorning my lovelies.. I hope the day so far has been treating you well. On a rare basis I am feeling a wee bit miserable. Reason? My dear husband is away for a business trip and I am missing him terribly. So to cheer myself up I decided to have one of favourite breakfast menus this morning; toast with peanut butter and jam. Now you must be wondering if I am crazy for I am writing about a basic jam and butter toast you probably have everyday anyway. Yes, this post is about the usual jam and butter toast. BUT BUT BUT, it talks about adding a twist to it. Coming back to my breakfast, when I picked out the peanut butter and jam bottles from the fridge I saw some coconut sitting in a bowl right next to them. As crazy as I am to experiment, I took the coconut out and shredded it with a grater. I made my usual toast with jam on one side and peanut butter on the other and then I layered it with the lovely shredded coconut. You won't believe but the twisted shredded addition worked wonders with the already amazing jam-peanut butter combination. 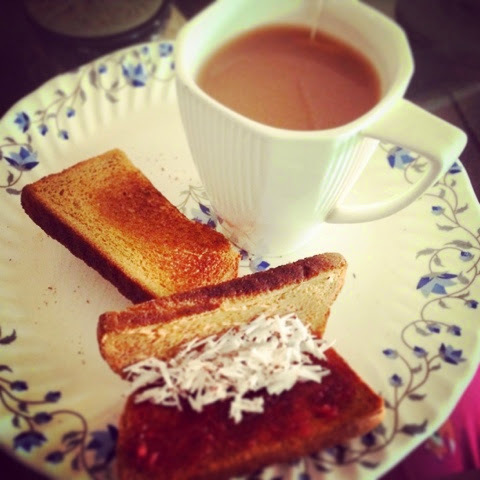 The coconut added a new texture to the toast. The taste was mild, not overpowering and yet making you feel it's there. There are so many other ways you can add a twist to your jam butter toast. Bananas are often a popular choice. You can also use fresh strawberries. A few crushed almonds and walnuts will add great taste and crunch to the toast. look at this beauty! now won't you want to much it right away? Use your imagination and the ingredients you have on your hands. Sometimes the most unexpected ingredients end up surprising your taste buds and in a very pleasant way. For this toast you will need the following. Take the slices of bread and toast them. Now take one slice, apply jam on half and peanut butter on half. Spread half of the shredded coconut on the slice and fold it. Repeat with the other slice and enjoy it with your cup of tea/coffee. Note: I toasted the bread but you can have it raw too. It really depends on how you like your jam butter sandwich.